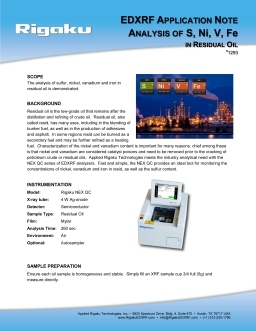 EDXRF | XRF for Petroleum & Petrochemical - Applied Rigaku Technologies, Inc. 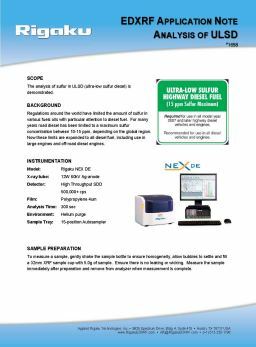 The new low cost Rigaku NEX QC benchtop EDXRF delivers compliance with the ASTM D4294 sulfur method (also methods: ISO 20847, ISO 8754, IP 496, IP 336, and JIS K 2541-4) with an easy-to-learn software interface in a robust package specifically designed for the petroleum industry. 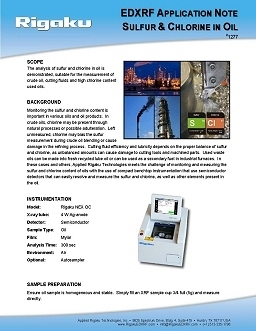 Optimized for routine determination of sulfur in petroleum, including crudes, heavies, bunker fuel and for upgrading operations, the instrument features an intuitive and modern "icon-driven" touch screen, Smartphone-style interface for easy operation and a built-in thermal printer for convenience. 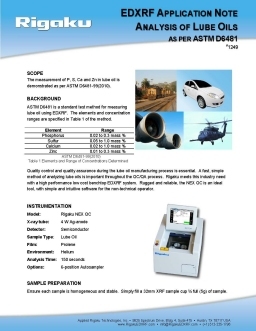 In addition, the new Rigaku NEX QC+ instrument delivers compliance with the ISO 13032 sulfur method for ULSD and the Rigaku NEX CG benchtop EDXRF is compliant with the ASTM D7220 method for ULSD. Lubricating oils are used in on-road and off-road engines, as well as in the lubrication of mechanical machinery. 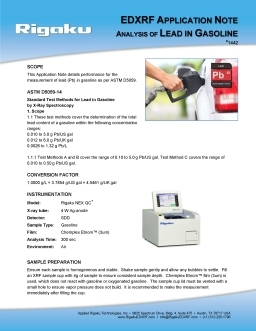 Each type is specifically formulated for a particular use. Various additives are formulated in base lube oil to enhance lube oil performance and create the optimum lubricity properties desired for each situation. 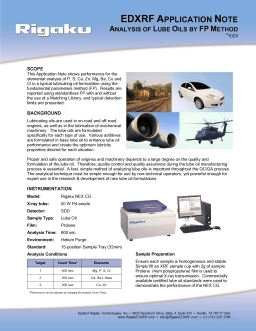 Proper and safe operation of engines and machinery depends to a large degree on formulation of metallic additives. 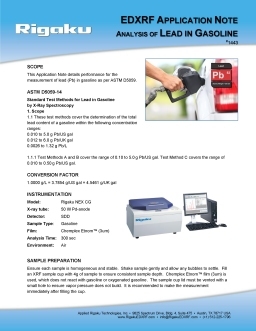 Rigaku offers the Rigaku NEX CG benchtop EDXRF as a fast, simple method of analyzing lube oils for metallic composition. The EDXRF analytical technique is simple enough for use by non-technical operators, yet powerful enough for expert use in the research & development of new lube oil formulations. 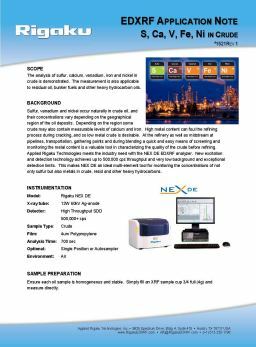 Rigaku NEX XT is the next generation process gauge for high-level total sulfur measurement (0.02% to 6% S) of crude, bunker fuel, fuel oils, and other highly viscous hydrocarbons, including residuums. 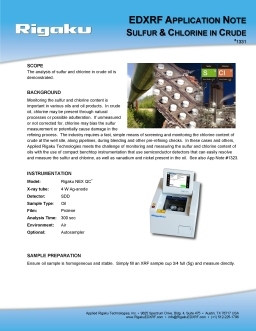 This versatile, compact and robust X-ray Transmission / Absorption (XRT / XRA) process gauge is specifically optimized for the total sulfur analysis needs of refineries, pipelines, blending operations, bunkering terminals and other storage facilities.